Arguably Mark Twain's greatest fiction was "Mark Twain." Several of the characters in his novels -- Colonel Sellers, Tom Sawyer, Huck Finn -- became well-known even to people who never read the books, but in his time and since, the image of "Mark Twain" himself is one of the best-known reference points in America's cultural imagination. He was not only the nation's first literary celebrity; "Mark Twain," born in the Nevada Territory in 1863 of Sam Clemens' ambitions, nurtured by publishers, editors and other promoters, adopted by a grateful American public, "Mark Twain" became a kind of mythic hero. This section of the archive attempts in selected ways to record the story of how Clemens and his times shaped that image. At left: MT himself probably designed this emblem, featuring all his initials as both "Mark Twain" and "S L Clemens." He used it as a letterhead during the 1870s; this section of the archive uses it as the icon for returning to this HOMEPAGE from any of the exhibits below. 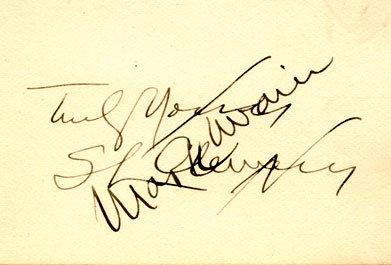 Below left: both MT's signatures, on a blank calling card in the Barrett Collection. When he signed his names in this overlapping fashion, he nearly always let "Mark Twain" cover "S L Clemens."